After the maddening G-1 loss, Dr. D checked the box score fearfully. Then the cowardly Dr. D remembered that his fearfully was just a flinch-fully, since this is a very good team we're talking about, for the first time in about 15 years. Lo and behold, it turned out that the '18 M's had scored a Big Red Machine style 9-5 split of the DH. James Paxton looms on deck. Terry, who knows as much or more about pitching as any of us, had demurred on the "Innings Eater" theory on the basis that Felix is not at all capable of locating a fastball. Point is well taken. That's what my eye sees also, that he takes careful aim, but ... the spirit is willing, the rotator cuff weak. Couldn't agree more with this observation. Agree also that it's tough to execute ANY specific type of game if you can't locate a fastball. Still and all, Felix is running an 8 K, 4 BB profile and if the Mainframe is not mistaken, the M's brain trust would rather see that trend towards 5 K, 2.5 BB. Between TJM and I, neither of us is at all sure how far he can make it in that direction, true. The thing is that Felix is used to seeing hitters take garbage swings at his yakker, and he's still getting them. So in 2018 the tread-bare Felix throws a fastball, and the count's 1-0. He comes back with a yakker, it's 1-1 ... and then he tries to paint for a 1-3 count. (Notice the M's commercial if you haven't seen it.) It's here, where he could come back with a much better piece of the plate and allow the (defensive) batter to ground out to short. But that's not where his head's at. Again he got 7 strikeouts vs. 2 walks Saturday despite his saying "I had nothing." What did you expect to have, sir Mr. King sir? A glorious lockdown game is what he expected to have. As always. Innings eaters, they'll give up 5 runs with a 7:2 CTL and say "After the second, I was hoping to keep us in the game. Some balls went through but the offense saved me this time." Innings eaters always say something about keeping their teams in the game, giving their teams a chance, giving the team six innings. Let me know when you hear Felix say anything remotely like that. Bring the K:BB profile down on both ends, sir Mr. King sir. That's free advice. In the Gamel-Heredia platoon battle, Acting Manny put Gamel in left for the second game. As is reasonable. Gamel went 0-for-5, which ... 0-for-4 is an oh-fer. 0-for-5 is, "don't tease him about it in the locker room." Healy wound up scoring to tie the game, 1-1. What was I gonna say? Oh yeah. Heredia's chase rate has had our eye since he first came up. How's he doing there? He's got a 9:7 EYE, that's 9 walks 7 strikeouts, and his plate discipline is a breathtaking 17% chase - 68% swing in zone. (Average is 30-66). As usual, Dr. D is preaching to the choir. Many, perhaps most, Denizens are fans of the Heredia. How do you keep that kind of player on the bench? He's an extreme glove specialist and he consistently leads your squad in the "Intelligent At-Bats" category. Ben Gamel would be a magnificent #4 outfielder. Quick reminder, he was a AAA player of the year. Quick quicker reminder, sabermetrics is about weighting heavily the way players actually perform. Whereas the end of the lineup impressed in G-1, it was the MOTO that inflicted the shock-and-awe in game two. In 12 games, that makes 17-for-47 (.362) with 4 doubles and 6 homers (.830 SLG) and 3 walks (.400 OBP). More importantly, it is 13 runs and 13 ribbies during those 12 games. I remember when they used to say "When Buhner gets hot, he can carry your ballclub for two weeks." 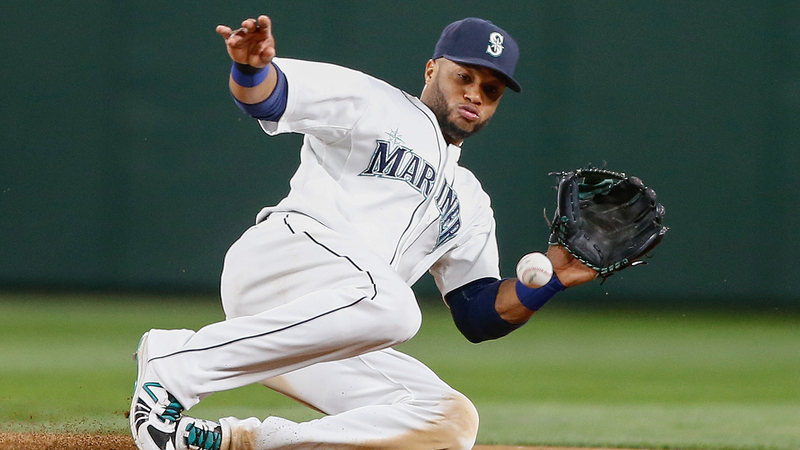 Robinson Cano, in Game One there was a one-hop, sharply struck single up the middle. Cano appeared in front of it, backhand, and used that shortstop's arm to flip across his body at 95 MPH, taking away the hit. Have you ever seen anybody better at that throw? Dewan has Cano for +1 plays made at second, compared to your garden-variety jitterbug second baseman in the majors, and +2 are to his right as you might think. If Cano is a quality glove at second, and boom-shak-a-laka he looks it every inch, then he's still a Hall of Famer who is in his prime. ...in terms of Fangraphs' camera angle, based on his .386 OBP he's got 1.1 WAR which projects to 4.7 WAR again. They're pitching around him a lot, for some reason I can't begin to figure out, and once a few HR's go over the fence for him he'll be comfortably over 5. When Gamel stepped to the plate in game one pinch hitting for Heredia, my teeth had just about ground down to the gumline. Apparently obeying a platoon split that not only doesn't exist, but in fact works to the opposite, Acta made the wrong call. For which the only saving grace was not being able to blame this insanity on Servais. Now, how many GMs favor 'their' guys over those gathered by their predecessors? I'm guessing about every one. But JD is betraying his own professed love of satbremetrics by continuously proving his bias. What did Gui do to him? Doc amply demonstrates the eye factor above. To expand on that, how many guys are currently exceeding a .400 OBP while also being dragged down by a BABIP in the neighborhood of .250? The 'competition' with Gamel is a no-brainer. I'm willing to concede that Gamel is a better player than the numbers show so far. But I also remember that Ms fandom fell in love with him the first half of last year...largely on the basis of a .422 BABIP. So far in 2018, Gamel's OPS-ing .443 against righties...while Gui is cruising along at .847. So why, Jerry, do you pinch hit for Heredia? And I'll throw in the current 150-game UZR projections for runs saved among our outfielders: Dee -17; Mitch -4; Gamel 3; Heredia 36. This is a statistical mismatch of epic proportions. The front office might say, "yeah, well it's a small sample size, and there's no guarantee Heredia could keep this up all year." Yeah, well, there's one way to find out--increase the sample size! PLAY HIM EVERY DAY! Even Jack Z would have figured this out by now. Our pythag has us at about a .500 record so far. Negative regression is not out of the question, even with our lineup. If you want to win more, play Heredia. We don't have a lot of margin for error. Even if this is more an outlier than actual improvement in his game, Heredia may wind up spending his career year sitting on the bench. This is on you, Jerry. Man up. I would even go so far as sending Gamel down so he can play every day and hope he finds himself. Funny how DiPo, an ex-pitcher, has such a good eye for hitters. Or maybe not. Maybe he sees guys doing things they did to him and knows they can do it to everyone else. In any case, I gotta admit I was not a fan of the Healy trade and favored giving the Large Child a real shot. I was afraid Healy was one of those Orcs who would lose his abilities absent whatever Bean feeds his evil army. Boy was I wrong. Healy is the most dangerous bat in the line-up right now, Pagan is in AAA where he's probably walking the Large Child. Thanks for the kind words, Doc, but I'm going to demur further (should be a word - demurther) on the diagnosis. I still have hope Felix can become effective pitcher. He's a tragic Greek hero at this point - the thing that made him great is making him humble. He was always blessed with extra-bendy pivot points - his finger and wrist joints - which created extraordinary movement on his pitches. If I remember correctly he would ocassionally increase the spin rate on a two-seamer by fifty percent, which ought not be humanly possible. My hope is probably more of a wish at this point but I can see him figuring out where the damn thing is going and becoming a legit number two. Pitchers used to not know what caused their pitches to move. Not that long ago any particular guys' movement was thought to be unique to him; it was natural. Felix persists in that. He throws the ball and trusts in his history as to where it will end up. Ain't working. Too many of them are ending up in the bleachers. And I don't think the staff has the technical expertise to help him. I think they need to send him to DriveLine for a month this winter and make him learn how to pitch. I could see a version of him who throws no two-seamers, going with a cutter instead as his main fastball. A cutter is theoretically easier to control because there is little to no manipulation in the mechanics. .....but he's hitting terribly. It is an ugly thing, right now. Send him down, play Heredia enough vR to see if he's figured that out yet, and call up Andreoli or Miller, both of whom are above .320 for Tacoma. Let Gamel figure it out without impacting a WC race. Heredia is hitting .250 vR, but walking enough to be above .400 OBP. Anyway, it's hard to figure out how to replace Cano's defense at second--except that we have that answer in Gordon. That not only maintains the defensive excellence in the infield, but allows Heredia to play every day in center for a couple months to see what he can do. And he will improve the defense out there over what we've got now. In left, you can platoon with Gamel or Miller of Andreoli or anyone else you think makes sense. That's also maximizing the lineup until Cano returns...unless you believe that Beckham has suddenly found something in Tacoma that he's been missing his entire career. (I think that's unlikely.) And even if he has, he's a clear step backwards in defense at second. But anyway, to get back to the key question--why, JD, would you not even consider moving Gordon to the infield? Why is that not even an option? Miller is a + glove guy (maybe ++), a left-handed bat, can run, and is hitting really well this season. Last year, a AA/AAA combo, he hit RHP to the tune of .292-.346-.378. This year in Tacoma that line looks like .348-.411-.402. He's changed his approach a bit, adding a lift-stride left leg action rather than a toe-tap, as he has used in the past. You can see it in these two AB's. The 1st, of his lone homer this season, clearly shows his new approach (more aggressive) when compared to the 2nd, a homer from last season. Andreoli's packing a hot bat this season. .908 hot, in fact. He's shown negligible split delta in 4 seasons of AAA, generally hittiing RHP a bit better (as he is this season). He won't suffer vs. RHP. I think it was Joe Madden who said Andreoli plays like his hair is on fire. I like that. Beckham has benerally proved to be a average or slightly better fielder at 2B. He's a career 81 OPS guy, but he hasn't topped 77 since 2014. However, he did have a .912 bat in Tacoma this year. Still, I'm betting on past performance. Is Beckham a better bat than Andreoli or Miller? That is unlikely. Is he a better glove at 2B than Gordon? Also unlikely and both Andreoli and (especially) Miller are good with the OF glove. Miller is a natural CF. Moving Gordon to 2B is probably the better move than keeping Beckham there....or adding Motter. How long would it take Gordan to comfortably return to a position he's played forever? Likely about 3 minutes. C'mon, he's had 502 MLB starts at 2B! For my money, return Gamel to AAA and let him find a stroke (He will, but something is wrong right now, he's had 90 AB's in A, AAA and Seattle, without a homer and only 5 XB's), move Beckham back down, put our GG 2B back at 2B, and use Miller and Andreoli as OF's 3/4, with Miller in CF when he plays. Recall Gamel when he hits with some XB pop. Heredia is 4-17 vR, but with 4 BB's. Spoiler alert: He will not continue to walk .150+ points. I still do not trust him vs. RHP. Neither does Servais, I think...otherwise a struggling Gamel would be bumped out already. Moving Gordon to 2B is not admitting a CF experiment failure; it actually highlights the genius of grabbing him. And it most probably makes us a better team, both offensively AND defensively (in CF and at 2B). Isn't THAT the idea? I can't see why this is even worthy of much discussion between Dipoto and Servais. Say it ain't so, Robbie! But this may be the reason that Dipoto has said he's not moving Gordon. Maybe he knew that the suspension was coming and it freed up $9M or $10M. My understanding is he tested positive for furosemide aka lasix, which is the most commonly prescribed diuretic in the world. Often used to treat edema or high blood pressure. Apparently it can also be used as a masking agent to make it harder to detect PEDs. Lots of legit reasons for it to have been prescribed. Should be able to fight it unless there’s also a positive PED test. Sounds like the test was months ago and that there was a subsequent test.